This is part 2o of the translation of my treatise Jesuspassagerna hos Josefus – en fallstudie into English. Independant alterations: It would be nothing special if two authors independently made ​​similar small changes to a text. The thing is that many have copied the Testimonium and many have also made ​​small modifications to the text. If in all these versions there are two writers with deviations of similar nature, this does not mean that they necessarily reflect the correct reading. Besides, they are not witnessing the same wording as two translations into two different languages are involved. Anyone who has ever translated something knows that there almost always are various alternatives concerning choice of words and sentence structure. It is assuredly true, that if one is to translate the Greek ἐνομίζετο into Latin, it is entirely reasonable to translate it into credebatur. Whealey also claims that the best translation of ἐνομίζετο into Syriac would be mistavra. But this is by no means certain. Moreover, it is not unlikely that both Jerome and the unknown Syrian chronicler would have chosen to tone down the statement in the Testimonium so that it appeared more plausible that Josephus could have written it. Neither are there many linguistic options to choose between if you want to make the expression “he was the Messiah” less absolute. He was believed to be, he was thought to be, or perhaps he was the Messiah. These three variants are precisely the ones that we encounter in Jerome, Michael and Agapius. Alterations of the texts. If you want to argue that the Testimonium in Eusebius originally read “he was thought to be”, this means that you also have to assume that all subsequent versions and all later quotations from Eusebius, not only from his Ecclesiastical History, but also from two other works in which Eusebius reproduces the Testimonium, have been altered. 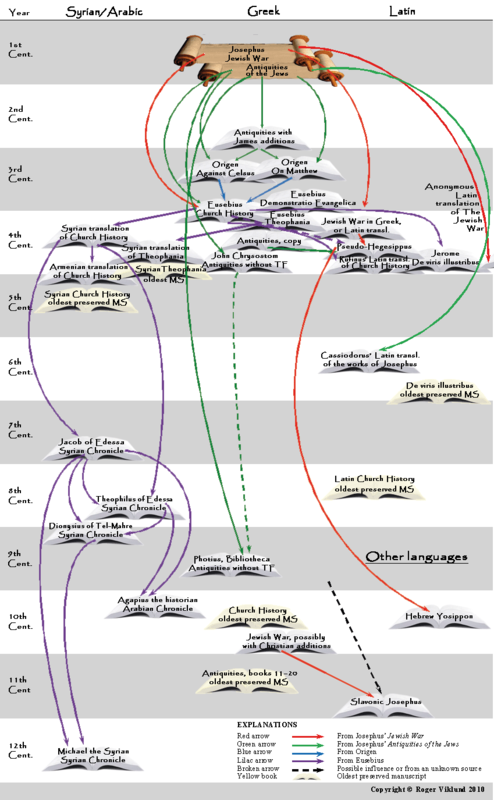 This implies all the early translations into Syriac, Armenian and even Latin (made ​​around the year 400). That line of argument would be tantamount to assuming that all the three times when Origen mentions “James, the brother of Jesus called Christ” the text originally only read “James”, and that the “the brother of Jesus called Christ” was added afterwards in all three instances in the two books, and similarly in all subsequent quotations made by Eusebius, Jerome, etc. To assume that all editions of Eusebius’ works and virtually all quotation out of these have been changed, requires a much larger effort for success and appears therefore unlikely to have been done. Differences between the two. Provided that Jerome and the Syrian chronicler used a common source that better reflects the original reading, there should be other similarities in their choice of words which does not appear in the received text, apart from “he was thought/believed to be”. No such similarities can be found. Instead, they both have small individual deviations from the received text; deviations which are not the same. Jerome writes that it was “through the envy” of the Jewish leaders that Jesus was executed; something which is not present in the Syriac text (or the received text). The Syriac text on the other hand says explicitly that Jesus died; something neither Jerome nor the received text says. Now, if Jerome and the Syrian chronicler would have had a common source, at least some other similarity should exist. Instead, this shows that none of them was afraid to make changes to the text; something that implies that they also individually in the translation may have changed “was” into “was thought to be” respectively “was believed to be”. Is it then possible that the Testimonium could have read something like “he was believed to be” in all the three books where Eusebius reproduces the paragraph? It is of course possible that this is the case. But the weight of the above facts – namely 1) that it is perfectly reasonable that Jerome and the Syrian chronicler made the changes independently of each other, due to the fact that they also changed other things, 2) that there are much older manuscript witnesses for the reading “he was”, 3) that in this case all later versions of and quotation from Eusebius then must have been changed and 4) that Jerome and the Syrian chronicler has no other common vocabulary beyond that which also occurs in the received version – is against that. How about Pseudo-Hegesippus’ paraphrase of the Testimonium then; is it proof that the Testimonium was in the Antiquities of the Jews prior to Eusebius and that the expression “he was the Messiah” was either completely missing or read “he was believed to be the Messiah”? Pseudo-Hegesippus may well have found the Testimonium in his copy of the Antiquities of the Jews, but it is not at all impossible that he, too, drew on Eusebius. However, if he drew on Josephus, he can also just as easily have found the Testimonium in the Jewish War (which was his main source) as in the Antiquities of the Jews, and in both cases there were enough time for the Testimonium to be inserted from for instance the model of Eusebius. It is less likely that the phrase “he was the Messiah” was missing, than it actually occurred and that Pseudo-Hegesippus used the statement to confirm that the Jewish leaders believed Jesus to be divine (see Acknowledged his divinity). But let us say that the Testimonium both preceded Eusebius, and contained a downplayed version of the appointment of Jesus as the Messiah. Would then this latter fact make it likely that Josephus has written the Testimonium? Would it, like for instance Whealey argues, show that Josephus wrote the Testimonium in its entirety with only the modification “he was thought to be the Messiah”? No, it hardly would, as such a solution still would not resolve all the other basic problems of the Testimonium being generally pro-Christian; that Josephus in any case would have had to explain the messianic concept; that no one before Eusebius shows knowledge of the Testimonium and because of that seem unaware of the passage; and that the Testimonium causes an erroneous allusion backwards and therefore does not fit into its context. In summary, it is found that: 1) The passage is still not witnessed before Eusebius, even though many had reasons to refer to it. 2) The text is on the whole very positive despite the fact that Josephus otherwise expresses his disapproval of other people of similar character. 3a) The ideas presented are Christian and the author profess the Christian faith, despite the fact that Josephus does not give the slightest hint of being a Christian. 3b) Even without the emphatic statement that Jesus was the Messiah; it is still by the prophets prediction made clear that he was the Messiah. 4) The contents of the paragraphs 3a and 3b are also in glaring contrast partly due to Josephus already having appointed Vespasian as the Messiah, partly because he otherwise never uses the word Messiah, and partly because he should have explained the messianic concept (even with a statement that he was believed be the Messiah) for those people who found an expression like “the wetted” or “the anointed” to be incomprehensible. The oldest manuscript of De viris illustribus is found in the Vatican Library in Rome, Biblioteca apostolica vaticana, ”bav reg lat 2077”; a manuscript which is usually dated to the sixth or seventh century. The second oldest manuscript is in Paris, Bibliothèque nationale de France ”Paris, BnF lat. 12161”; probably written ​​at the end of the seventh or the eighth century.